WHAT IS NAIL SALON NEGLIGENCE? This refers to the failure of a nail salon to provide a safe environment for its patrons which causes injury. Often this means that the nail salon has failed to properly sanitize the foot baths used for pedicures, or it means they have failed to properly sterilize the tools and utensils used on their clients while giving manicures or pedicures. It can also mean the technicians have failed to use the proper procedures in performing the service and have caused lacerations or some other type of injury to the client. The business model of the nail salon is to do a volume practice of nail treatments. If the nail salons do not properly sanitize and sterilize their equipment the bacteria left by each of the clients receiving hand or foot treatment spreads. Manicure and pedicure tools and utensils which have not been properly sterilized, dirty footbaths, and contaminated chemicals can lead to a number of infections (staphylococcus aureus, fungal infections and bacterial infections), severe scarring, pain, amputation, respiratory problems and in extreme cases death. 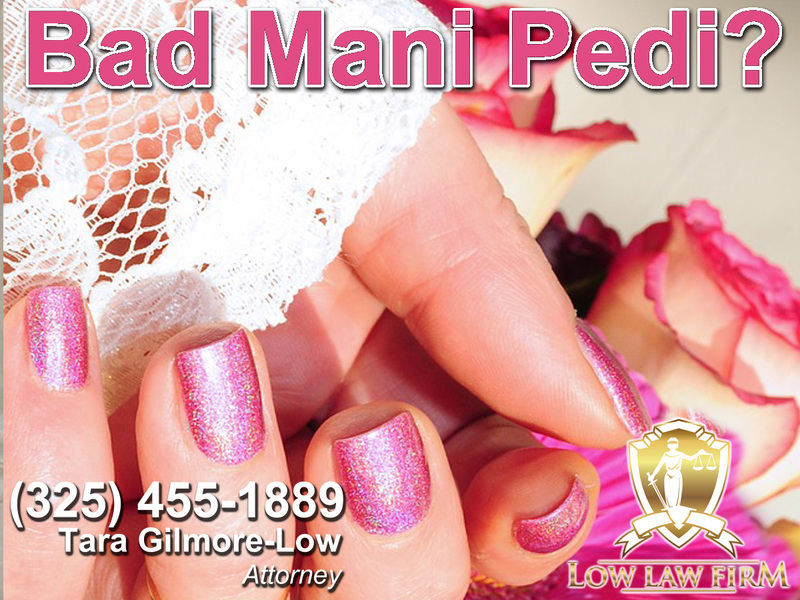 Tara Gilmore-Low of Low Law Firm in Abilene Texas handles all types of Nail Salon Injury cases. WHAT ARE THE CAUSES OF NAIL SALON NEGLIGENCE? In most of the cases that Low Law Firm handles the causes of nail salon negligence stem from the owner(s) of the salon failing to provide proper training to their employees, failing to implement a quality assurance plan to ensure that employees are using the tools correctly and properly sanitizing or sterilizing all the equipment and/or failing to properly sanitize or sterilize the equipment at all. The most common cause of injury in a nail salon injury case is infection from unsanitary tools or equipment combined with a technician’s failure to use the tools and utensils correctly. WHAT ARE COMMON INJURIES IN A NAIL SALON NEGLIGENCE CLAIM? Nail salon negligence injuries can be quite extensive. At Low Law Firm, Tara Gilmore-Low has handled cases involving severe infections, amputation and in most extreme cases death. Frequently, during a manicure, nail application or pedicure the technician will cause a laceration. The laceration will then be exposed to an unsanitary piece of equipment or foot bath which causes an infection to develop. In some cases, the technician will be carrying the infection, such as MRSA and the client will contract the infection from the technician directly. Many times, the infection simply goes away and requires little to no medical treatment. However, all too often the infection develops into something much worse which can require lengthy hospital stays or amputations. Bacterial and fungal infections that require extensive hyperbaric treatment and hospital stays are not only physically damaging, the clients bear the cost of this treatment. In cases where the client contracts MRSA the client will carry the infection for their lifetime and have to deal with recurrences of the infection throughout their lifetime. WHAT ARE SIGNS AND SYMPTOMS OF NAIL SALON INFECTION? The most common signs you should be aware of are redness of the skin, fever, soreness around the nail bed, irritation around the nail bed, rash or discoloration. Because soreness can be common after a nail treatment, clients will often ignore it until the infection has spread and requires extensive treatment. It is imperative that you monitor your fingernails and toes closely if you suspect anything could be wrong after your nail salon treatment. If you experience any of these symptoms go to the doctor or hospital immediately. WHAT ARE MY RIGHTS IF I HAVE BEEN INJURED IN A NAIL SALON? Nail salon injuries are often the result of negligent management and negligent employees. In Texas, nail technicians are required to have proper training, accreditation and experience for most nail treatments. If your nail salon fails in their duties to you and causes you any type of nail salon injury, you should contact Tara Gilmore-Low of Low Law Firm for a free consultation immediately. WHAT CAN I DO TO RESEARCH MY NAIL SALON? The first thing we recommend that you do is go online and see if the nail salon that you are using has any reviews. Be cautious of nail salons with low ratings and make sure to read the reviews to find out what the complaints are. Another important research tool is the Texas Department of Licensing and Regulation website, the link is below. The TDLR governs licensing of technicians and facilities in Texas, as well as complaints and inspections. You can find a wealth of information on their site. If you don’t find your facility, call them they are happy to help. If you have received an infection during a manicure or pedicure while visiting a nail salon in Abilene, Texas call Tara Gilmore-Low of Low Law Firm for a free case evaluation. Low Law Firm handles all types of nail salon negligence cases. Call Low Law Firm to speak with an attorney today. (325) 455-1889.